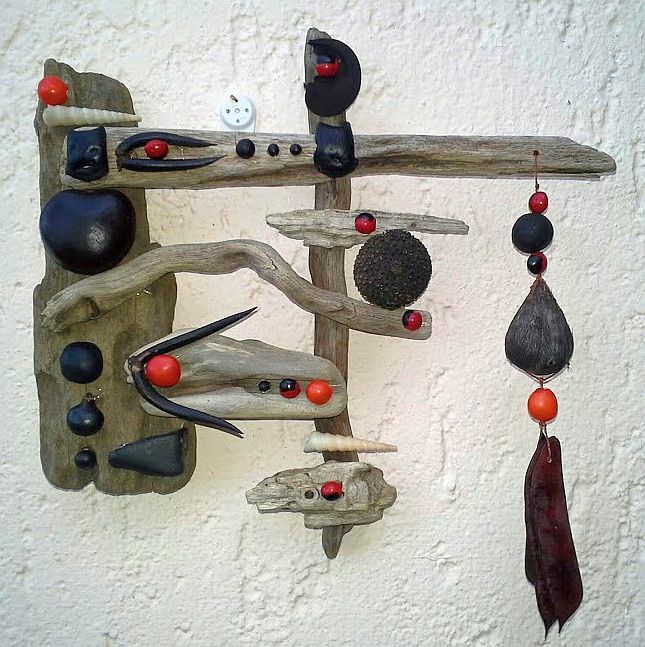 Here are some beautifully simple collages, created on one piece of driftwood. The sea beans are lovely. They look great displayed together! Red Adenanthera pavonina, Sea Heart, Ox Eye, Guanacaste Tree Seeds, small brown nickernuts?, grey nickernut, acacia tree pod and thorn. 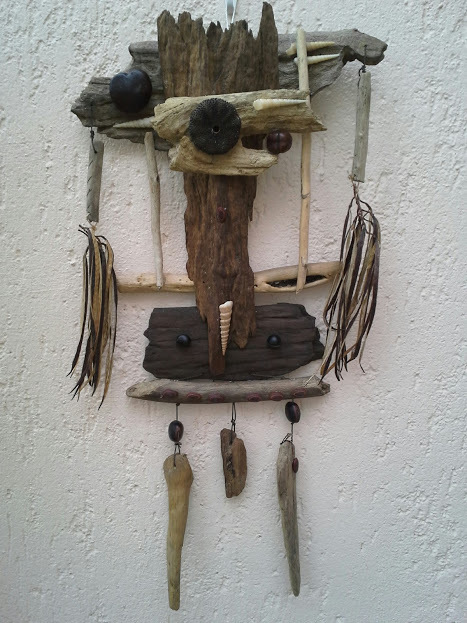 Another simple collage on one piece of driftwood. Seeds: The lovely “Oxy” round black seed (Oxyrhynchus trinervius), Sea Heart, Ox Eye, Guanacaste Tree Seeds, Acacia seeds, red and black “Nene” seed. Invitation: Enjoy your adventures, but return home to rest and refresh yourself. Find your tribe. Appreciate sunsets. The lovely black Acacia Tree thorns! Round Prickly palm nut, small brown Sea Pea, round Monkey Comb (A. aspersa) drift seed, Guanacaste Tree seeds, Sea Purse (Dioclea reflexa), a lovely black “Oxy” seed, and seeds and pod from the “Mexican Bird of Paradise” Tree. Invitation: Start Monkeying around. Be playful. Don’t take yourself too seriously. Enjoy the moment. 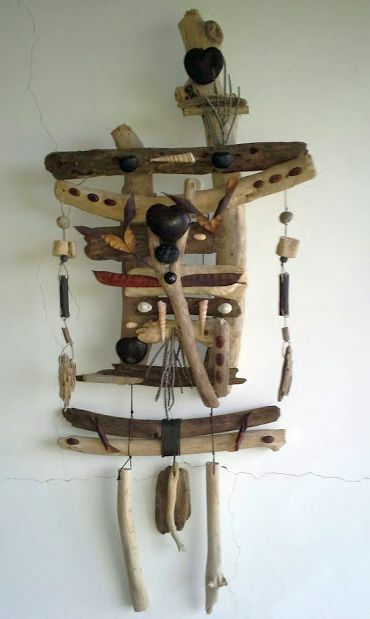 Below is a display of more single piece driftwood and drift seed wall collages. The one on the left and the one on the right are still available. 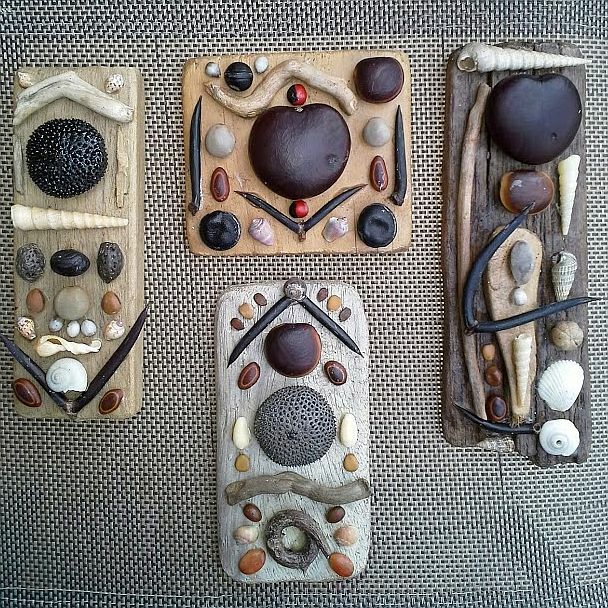 Four small drift seed collages displayed together. Seeds include: Sea Heart, Ox Eye, gorgeous and rare black “Oxys” (Oxyrhynchus trinervias), Guanacaste Tree seed, a lovely Sea Purse (Dioclea reflexa), Tears of St. Peter seeds, tree pods, and one mountain snail from Punta Uva, Costa Rica. 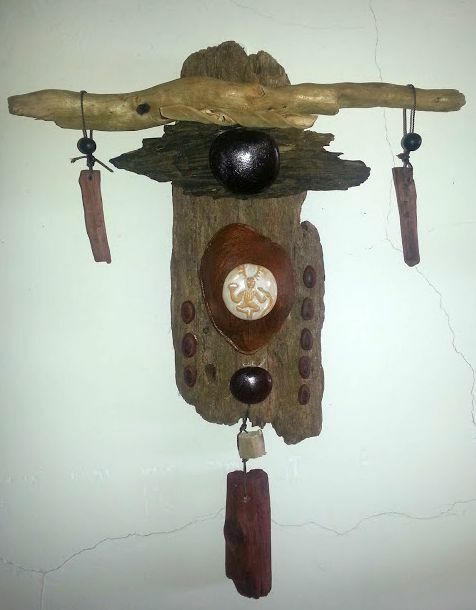 The beautiful large black thorns are from the A. cornigera Acacia tree. The white spiral shell I found up in the mountains of Punta Uva, Talamanca, Limon, Costa Rica. I love it! Invitation: Appreciate the details. Go with the flow. 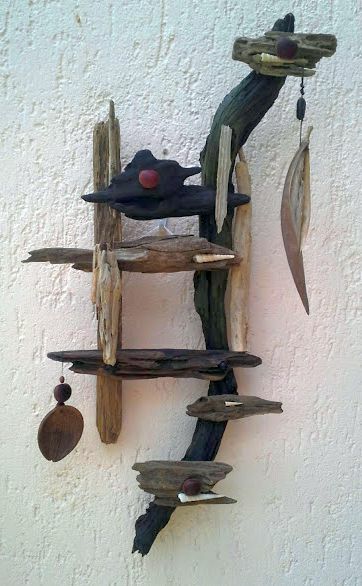 With a gorgeous center piece of drift wood, which I have had for years, as well as the two dangling seeds. Bottom left dangling: Prioria copaifera. 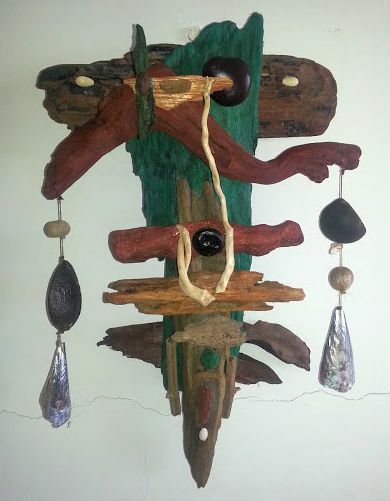 Top right dangling: Flame of Africa Tree seed pod. and two shiny black seeds (Oxyrhynchus trinervias). Invitation: Be sensual. Feel the wind on your skin. Enjoy community. Hang loose. Invitation: Feel your power. Center yourself. Connect to your Inner Higher Self. I stained this to make it come alive. Invitation: Color your world with your passion. Dare to be you. Play. 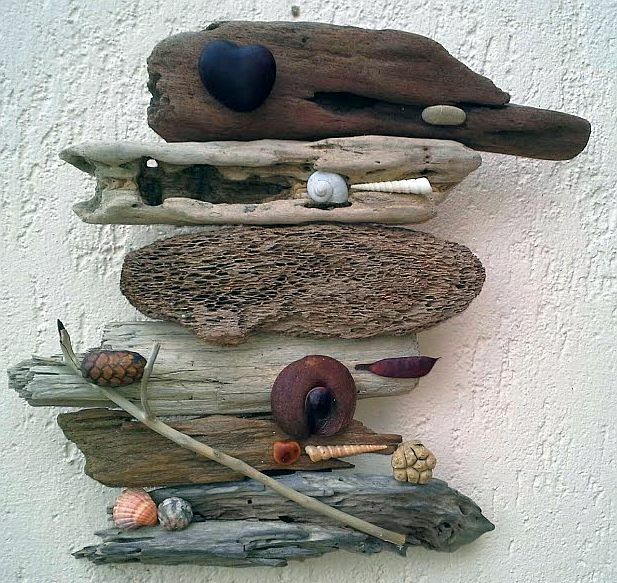 Brown and white driftwood, with a mix of drift seeds and shells. 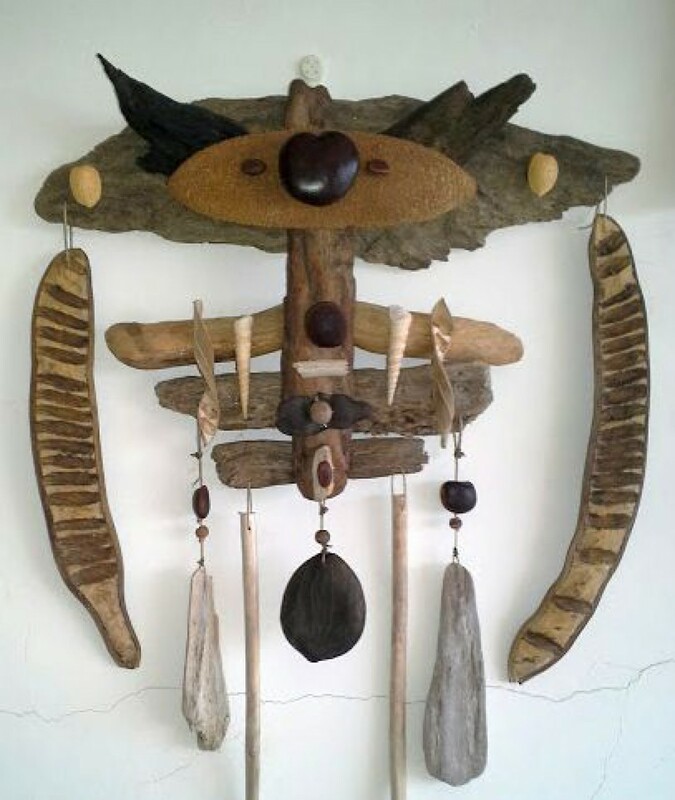 Includes Sea Heart, Ox Eye, Guanacaste Tree seeds, Grey Nickernut, Little Marble, pods from Acacia Trees, palm fruit stems, and shells from Costa Rica. Invitation: Follow your heart. Stay on your spiritual path. Be willing to grow.